The first thing I thought when I saw this series was Phoenix Wright with magic. That concept alone would have been enough to draw a large audience, but where Phoenix Wright had its strengths, Wizard Barristers has its weaknesses. The opening scene to the whole series is interesting. Good voice acting, good action (although the physics get a little funny), and pleasant attention to detail. If you get to the point in that scene where the first explosion happens, you'll see the hanging handles on the passenger car are realistically affected by the explosion instead of given two frames repeated quickly to give it the illusion of being affected. The opening credits are pretty generic, the music is fairly forgettable. Shifts between major mode and minor mode as it alternates between happy images and people standing around dramatically. Overall I think the choices for voice actors for the characters weren't that great. I would have liked to hear a more varied range of ages on the female actresses. Unfortunately, most of them have the generic cute little girls' squeaky voice. I also think out main character was not properly made. She's young, ok. She's naive, ok. But if she's such a genius with the law then she knows the people judge by looks because of the nature of the cases she would have studied. The same goes with her behavior. I can expect her to be naive about some things, but to be that good at law at such a young age she HAS to have a strong, commanding personality to match. Her personality would be perfect if she were an intern and studying to become a "Barrister", but not for someone at that stage in their career. To me this created a GIANT disconnect between me and her. I can connect with the other new person much better because she is more in line with the nature of what a lawyer is; direct, attentive, reserved until its time to speak out and be aggressive. I think if our main character were more mature and serious, this show would be great, but as it is I find the transitions between the real wolrd of the show and that girl to be too jarring and it breaks the ability to suspend disbelief. there's a lot wrong with this one. My main complaint was that the personality of the main character didn't seem to mesh with what we've been told of her backstory. She seems to be the bumbling and innocent klutz, and not the sort of person who would be the youngest ever to pass a wizard bar exam (that has to be hard, right??). I just couldn't believe a super law genius who breaks the law twice in the first episode and acts all dippy. Other than the backstory disconnect, I just found her to be an irritating anime cliche. The setting was ill thoughtout and kind of nebulous. They never addressed why wizards have to have their own separate barristers, or why these barristers must themselves be wizards. Why do they have to be battle ready, when it was pointed out that using magic to attack people is illegal (even, debatably, in self defense, since a character acting in self defense is instantly arrested and tried for murder)? Why does a barrister have to battle-ready anyway, doesn't law enforcement do that stuff? Pretty art, but irritating characters and uninteresting setting. First review, I wouldn't bother but hopefully I save someone the pain of finding this out directly. At first I felt the animation was well done and generally liked it visually (I'll elaborate on the 'at first' part in a moment, however). Basically the background to the story is that Witches/Wizards are coupled with the present day time and in this world their use of Magic is strictly controlled under law, in a similar manner as would the use of firearms for example. In any case, the lead characters are essentially Witch/Wizard lawyers working for (you guessed it) Witch/Wizard clients, and so that's that...so far so good yes. There are also Witch/Wizard police etc...Sure why not? Now the main character Witch/Wizard/Lawyer has a 'primary' power that basically involves building a mecca 'real-time' out of the surrounding materials nearby. Usually buildings, bridges, all sorts of fun things you wouldn't want to remove pieces from; Ends up looking like a jenga game but I digress. Of course, this power is at first seemingly presented as being unique however it seems that nearly every episode her main adversary has and uses the same power so that in the end the battles are less magic vs magic, and more mecca vs mecca (and yes they sit in the magic generated mecca). At the end of each battle the mecca are both inevtiably destroyed and that's that. Lastly, there is a fair dose of Fan Service in each episode, which probably it could do without. Not that its over the top but seems out of place and just thrown in (I know...that's why its called 'fan service' but...well it's poorly executed IMO). Basically the main characters pet/familiar (a frog) grasps some part of her anatomy (and says 'bon bon' or someother) each episode one time and gets smacked away. So all in all, yes it was getting harder to swallow, but I could still stomach it. Everything including and especially the animation went kapooey. I cannot see this one turning around late in the season, I'm calling it (looks at watch) this ones a goner. The basic idea behind the show, that we are going to be following defense lawyers for wizards, certainly has quite a bit of potential. Unfortunately, the pacing and characterizations seem rather off to me, and while I enjoy the attempt to do something new I found that the series ultimately just bored me. Clearly some people enjoy it and it isn't so offensive to rate 1 or 2 stars in my mind, but it's impossible to rate above 3 stars given that. I'd suggest giving one or two episodes a try to see if you like it, but don't expect anything brilliant from it. I'm not one to write reviews normally, but seeing as this series had none I figured I'd help some indecisive people out if I could. The animation in this is wonderful, very clean and colourful. Seeing as there is only one episode out at the time of writing this, I can't much comment on the story so far. I will say the premise for the show is original to me: Magic Lawyers for the wizard community. And so far it is far from the 'boring' label lawyers rightfully get slapped with. 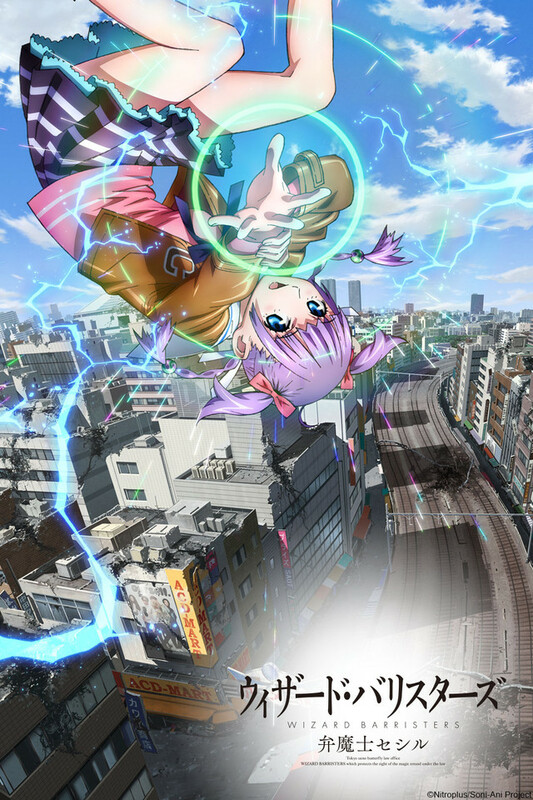 The first episode was chock-full of action from start to finish, and the magic is kinda pretty to be honest. Edit: The protagonist is also pretty cute and it seems like she could turn out to be a pretty bamf wizard. If you can spare the ~25 minutes, I'd definitely recommend adding this to your weekly queue. This show had a LOT of potential... but it just didn't live up to it. A lot of great ideas but for me everything seemed a little rushed. I feel like this show would have benefited more from 24 episodes instead of 12. The budget being blown -- it shows they bit off more than they could chew. The series starts at around an 8 out of 10 and ends to a 4/5 out of 10. The first episode was amazing and definitely pulled the audience in, however, it goes downhill from there. The animation was well done and the plot seemed interesting. They could have gone many ways with this story route but chose one that I believed was more complicated than could be explained in 12 episodes. I feel like this would have been better as a movie instead of a series. The series seems to explain every plot hole but it isn't until you finish it when you realize that nothing really felt like it was explained. Nothing was satisfactory. I hope future projects similar to this are thought out a little more. I'd much rather watch an anime with average animation and an amazing plot than with amazing animation and poor plot. The show looks pretty good and the premise is kind of interesting, but after watching the first episode, things seemed to happen way too quickly. It seemed like they tried to fit in 2 or 3 episodes into one 20-ish minute ep, which made the flow of the plot very.. strange. I'm not a fan of shows that do this sort of thing, so I may be a bit more biased, but the first episode, while having some promise to be an interesting show, was pretty disappointing overall. I'll give it one more chance I think, to see if the second episode can hopefully not be to fast-paced and uninteresting. I'm being a bit generous with the 3 star rating, however.. if I could I'd probably give it more of a 2.5 out of 5. Kind of neutral on this series - interesting story/concept but the character is a bit too eccentric and the plot lines are not fully developed. It's a bit like ok that happened so lets move on. The balance of character development and the story wasn't right and it didn't draw me in. NOTE: I had planned on following this series, but I ended up dropping it after the 3rd episode, so this review is solely based on the first three. As many people have said already, it's basically like Law & Order meets Phoenix Wright by the way of a Harry Potter party. That was certainly my impression from what I've seen--you've got Cecil Sudo, a perky, almost too-cheerful teenage wizard lawyer who is (I think) attempting to become a great "barrister" so she can free her incarcerated wizard mom from jail. I think. And then there's all the other members of the Butterfly Law Office, most of whom seem to be female(?) except for the two odd guys out. There's also apparently a rival office of some sorts, "Shark Knight" or something like that...at this point, can I just say that the names are borderline-cheesy? Butterfly I can handle, but Shark Knight? Not sure how I feel about that. And most of the episodes that I watched were kind of episodic, almost a L&O type formula--they get a case, they investigate, try to find the truth, and sometimes they get into scrapes with bad "Wuds" so they must bust out their cool magical powers. I'm sure there is an overarching plot--probably involving Cecil's mom, and her burgeoning magical powers. But I'll be honest, after three episodes, I found myself questioning why I was still watching this show--it's not bad, by any means, but at the same time, I couldn't find myself caring about any of the characters--especially the MC, whom I found to be borderline-annoying. I get that she's a teenager, and they want to emphasize her innocence, but it felt too unnatural to me; as many have said, it feels very Mary Sue-ish. Which is not what you want in an MC. Also, one thing I personally don't like that Umetsu seems to do a lot is constantly assigning his female characters tons of annoying nicknames that seem to change depending on who's talking. This was an issue in Galilei Donna, his show last season, which I ended up being disappointed by. So why did I ultimately end up deciding this show was not worth my time? Mainly because I couldn't care about the characters--not Cecil, and not really any of her co-workers or supporting cast. The only ones I maybe would've like to stick around for were the chain-smoking police lady and her partner, but that's about it. I suffered from the same issues of Galilei Donna last season, which was also an original property by Umetsu--so maybe the core issue is that I'm simply not a huge fan of his works. This is also probably exacerbated by the fact that I was quite wary of his ability to pull off another show directly the season after GD, which didn't end very well. Also, why does it seem like all the animal/familiars are perverts? Magic meets the justice system. If anything it's original. This show follows Cecile a Wizard Barrister (Basically a wizard defense attorney), as she hopes to defend her fellow wizards, and eliminate the unfair bias the system holds against them. Over all I’m enjoying the show, It’s got action and the cases seem to be enjoyable. The only thing that doesn’t sit well with me (as of the time of this review) is I would like to see more backstory with the main character. Other than the fact that she’s a promising young wizard Barrister, I don’t feel I know her all that well. I have a feeling that will change when we learn more about her mom though. This however, is one that I plain on following throughout the season, I hope you join me!